All of the Big Sur Hotels described here will likely meet your expectations, but it's often a matter of timing, the depth of your pocketbook, and good fortune that will determine at least in some part, where you will stay in Big Sur. Listen to what Linda and Jennifer have to say about their venture to Ventana and the "Big Sur." This is an extremely popular place especially in the summer months so planning ahead is key in getting the accommodation you are looking for. You are now one hundred fifty miles south of San Francisco and three hundred miles north of Los Angeles, and right in the middle of some of the most breathtaking scenery along the entire California Coast. Big Sur Accommodations here are unique and fit with the magical and romantic nature of this part of the coast. It can be a bit pricey, but the experience of being in this place makes any worry of missing your mortgage payment all disappear. Where to stay in Big Sur is a matter of preference. You can stay at the Ventana Inn ranked by Fodors magazine as one of the best romantic escape places anywhere ... or camp while snuggling together in an ancient redwood forest complete with showers and a mini-mart. 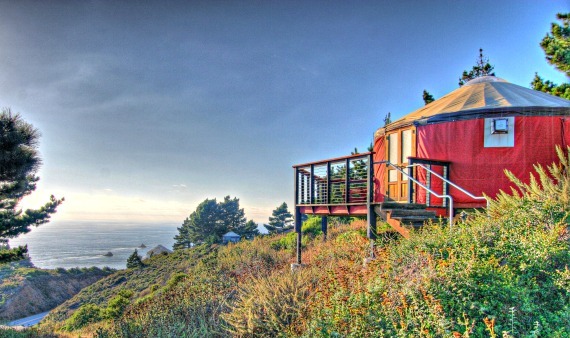 If your willing to travel a little farther down the Big Sur coast, and have a sense of adventure, you can even stay in a yurt built on a platform along the steep slopes of this area and eight hundred feet above the waves of the Pacific Ocean. Named the Treebones Resort, this is a place that will leave you with stories to tell your friends for years. While it might seem remote at first glance, you'll enjoy the fifty two foot cocktail bar that overlooks every gorgeous ragged inlet of the the Pacific Ocean below. While your here, know that you are in good company. These Big Sur Hotels have been frequented by writers, poets, actors, hippies and of course those of us who just want to escape for awhile. If you stay long enough, stay in several of the unique and unusual cabins and motels as well as the elegant resorts that are along this short section of coast. A week will undoubtedly change your romantic relationship for the better. You can choose to stay in hillside inns that will address your every need, in modest motels in the little villiage of Big Sur or in campsites along the Big Sur River. If your romantic idea of a coastal vacation includes the notion of quiet, privacy and serenity within a two hundred acre preserve, then these Big Sur Hotels on this part of the coast might be your ideal destination. These luxurious places have all of the amenities you could ask for and restaurants that look out over the southern Big Sur Coast. Staying here is pricey, but that's the case for this area since it attracts so many people looking for an escape from the rushed nature of most lives. Japanese spas, afternoon wine and cheese, guided hiking are all here and might just lend to a perfect romantic getaway. If you stay in Big Sur hotels like the Ventana Inn, you will be pampered in every way. Once your relaxed consider joining Stephen Copeland on his guided hikes for guest and others as well, into some areas not know by anyone else. If the idea of twisting canyon trails, green and blue vistas, waterfalls and redwoods seven hundred years old appeal to you, then take the Robinson Jefferes walk. This is a must outing for your trip to Bug Sur. You will need to travel quite a way elsewhere in California to see the six to twelve inch thick bark on these redwoods. Poison oak is abundant so take precautions! This is one of those things you'll never forget and kick yourselves if you don't make time for it ... and it's romantic, really romantic. If the price tag of these Big Sur Hotels is too much for your travel weary budget, then at least take the hike and have lunch or dinner on the outside deck of the Ventana Restaurant. The Post Ranch Inn is right across Highway One from Ventana and has been voted one the best hotels in North America. Stay in the butterfly room for a never to forget experience.. You may miss your mortgage payment if you stay here, but you will tell stories and have memories for months to come. Some have ocean views and some are nestled in the forest. The restaurant literally sits on a cliff with a steep drop off to the ocean. This should be on your bucket list...romantic memories can't be replaced or duplicated and it's only money...right? Rustic, Nostalgic, Charming and Romantic! Deetjens Big Sur Inn is distinctly rustic but wildly interesting and nestled along Highway One in the Castro Canyon is this Norwegian style lodging. The proprietors never need to advertise and your your host is a remarkable woman who lives the Big Sur life and can tell you stories for quite some time. 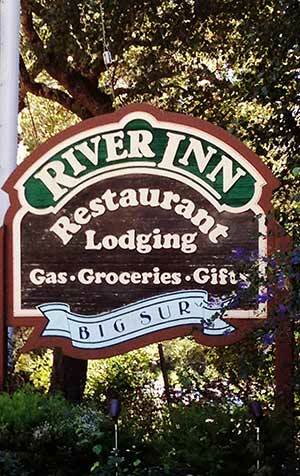 The Big Sur River Inn, near the village of Big Sur is close to smaller scale restaurants, gas, the post office and well known Big Sur Bakery. There is a full service restaurant along the Big Sur River, a pool and grassy area for a picnic if the weather is nice. The rooms are rustic and some have decks overlooking the Big Sur River. You can even dangle your toes in the river if you like. Nearby you will find a general store and rooms that have WiFi, but I suggest you leave that for another part of your travels.